University of Santo Tomas (UST) on Tuesday, January 28, 2014 released USTET results for Academic Year AY 2014-2015. Official list of passers for the entrance test is now available thru online inquiry on UST website by supplying applicant number and surname. USTET 2014 was administered by OFAD on September 1 and 29 and December 1, 2013 at UST España, Manila. Official USTET results is now posted online, January 28, 2014. 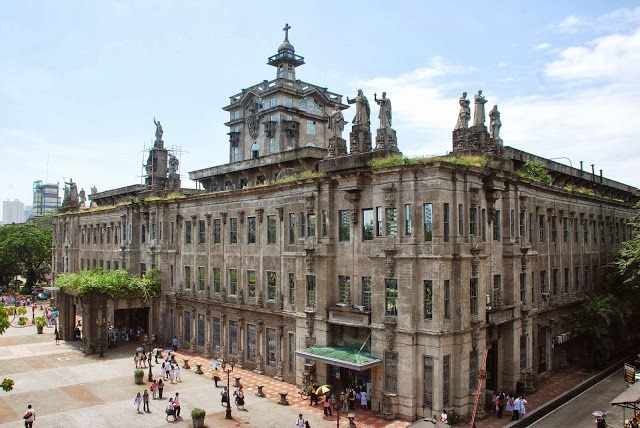 UST Admission results page portal can be accessed here. Aside from online availability of results, complete list of passers will be posted also in UST campus on January 29, 2014. 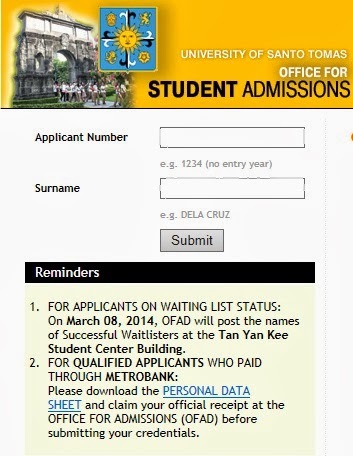 Meanwhile, the Office for Admissions (OFAD) in advance posted general instructions for USTET 2014 Qualifiers. Online: Please visit UST website (OFAD.UST.EDU.PH) for the instructions. On Site: Please visit the Office for Admissions(OFAD) from Mondays to Saturdays (except holidays) from 8:30AM-11:30AM and 1:30PM-4:30PM. 2. Reservation is by batch. Please take note of your batch and reservation schedule. (Only for qualified applicants with travel management, HRM or Nursing as their first choice. Please reserve your slot at the office for admissions (OFAD) only). 3. The reservation fee (P5,000) shall be deducted from your tuition fee upon enrollment. 4. If you reserve a slot in one program, you forfeit the slot in the other program. 5. Failure to reserve a slot within the specifies schedule will automatically mean forfeiture of your slot. 6. You are also qualified for admission to Colegio de San Juan de Letran-Manila and Angelicum College - Quezon City. For the qualified applicants who paid through Metrobank: Download the PERSONAL DATA SHEET and claim your official receipt at the OFFICE FOR ADMISSIONS (OFAD) before submitting your credentials. Meanwhile, for the applicants on waitlisting status: On March 08, 2014, OFAD will post the names of Successful Waitlisters at the Tan Yan Kee Student Center Building. The official online student publication of UST, TomasinoWeb reports that more than 14,000 applicants took the exam on September 1, 2013 only. In determining the list of qualifiers, 40 percent of the applicant’s total score will be based on his/her high school academic performance and the remaining 60 percent will come from USTET results.